Spectacular snow-capped peaks created an exquisite backdrop as we approached the Crown Isle Resort and Golf Community. Sprawled over hundreds of luscious acres, in its peaceful Comox Valley location, we had heard that this jewel of a resort offered meticulously groomed fairways, luxurious accommodation, exquisite conference facilities, and year-round recreation opportunities. Pathways, bordered by elaborate creek rock, directed our way to Crown Isle's focal point, the post and beam Resort Centre and from inside, its grandeur was highlighted by rich mahogany finishing and expert craftsmanship. Brass-railed spiral staircases led the way to sophisticated conference rooms, where spectacular vistas of the eighteenth green and the Comox Glacier could be enjoyed. A fully equipped fitness centre, complete with steam rooms and hot tub enticed the overly energized, and a cigar parlour overlooked a classic car museum boasting vintage collectables. The opulence continued to our Crown Isle villa where, from its spacious quarters, picture windows provided picturesque views of the first fairway. Elegantly appointed furnishings blended with its rich colour scheme to provide a luxurious setting. A two-sided gas fireplace could be enjoyed while either cuddling on the living room's love seat or while soaking in the bedroom's double-jetted tub. And if the tub didn't tweak some intimate sharing, the ensuite's double-headed shower undoubtedly would. Deluxe simplicity of marble, mirror, and tile flowed through both full baths, and other amenities included the TV/VCR, a luxurious array of toiletries and snowy white robes. Our modern kitchen and dining room later permitted an intimate candle-light dining experience, although the finest in West Coast cuisine can be experienced in the Resort Centre's elegant Conservatory Dining Room. For more casual fare, The Timber Room provides mixed grill favourites in a sports lounge ambience. 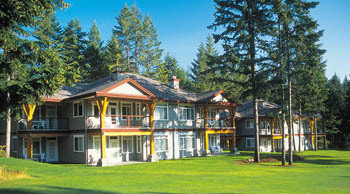 Crown Isle is ideally situated close to Mount Washington for ski hounds, the Strait of Georgia for beach lovers and Stratcona Provincial park for hiking enthusiasts. Salmon fishing, kayaking excursions and whale watching packages can also be arranged, although once you get a glimpse of the award winning golf course, you may want to just enjoy the property. That was our intention during our visit, although, as I was new to this sport, it was with some trepidation that I unpacked my clubs. "Let's take a few practice shots before we head out," Brent suggested. I think even he was a little leery about my skill at this new found sport, especially after witnessing my shots at the driving range and practice putting greens. "I've heard that this course is great for beginners as well as the pros," Brent reassured, aware that my uncertainty was building by the minute. "If you want, we can just play the front nine today." My uneasiness diminished somewhat, although I wished I had taken a quick trip to the resort's Golf Academy before heading out. 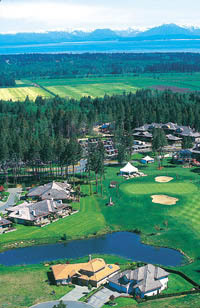 They offer professional instruction to help improve your performance and undoubtedly enhance more enjoyment of the game. The only reprieve I was to receive at this time, was transportation via golf cart as opposed to hoofing it. I stepped up to the first tee-off markers. Fortunately there was no one close behind to witness the shot that was about to occur. The practice swing scuffed the ground ever so lightly, then after the little step closer, with eyes glued to the ball and feet a shoulder stance apart, I repeated the same gentle move and…what a feeling! There's nothing like a great connection - not that I had had much experience with them in the past. It had been the confidence booster I needed. It was the stroke that would encourage me to take another and then another. Circling its perimeter, we followed the gentle contours of the land, passing by ponds and under stands of fir, all that were framed by sweeping mountain vistas. Bordered by the careful integration of quality residential housing, this classic link-style par 72 course, designed by Graham Cooke, has achieved honorable awards. Before I knew it, we had done a full circle. "Are you in for the back half?" Brent inquired, knowing full well how keen I now was now on this new found sport. As we headed off to the tenth hole, I looked back at the Resort Centre. The sun's rays reflected off of its wall of windows. Embraced by its manicured setting, it stood majestically in solitude, sparkling like a gem.